Since the FARC‘s abandonment of illegal activity in September last year, a handful of splinter groups have formed, all fighting to maintain some of the disarming guerrilla group’s abandoned clandestine power. While the exact number of dissident guerrillas and militia members is still unknown, the splinter groups have solidified to the point they have become identifiable as groups, jointly suspected of having more than 500 members. In Guaviare, a province in central Colombia that is rich in coca, some of the FARC’s fiercest fighter units, the 1st, 7th, 14th and 44th Front were removed from the guerrilla organization after its peace deal with the state. In the neighboring Vaupes province members of the Frente Acasio Medina deserted while the dissidents allegedly have also been active in Caqueta, the province west of Guaviare where a Nestle truck was burned last week. Together, they form by far the largest dissident group while exercising control in one of Colombia’s main coca-growing regions. While little has been heard of the 14th and the 44th Front, the 1st and 7th Front, respectively led by “Ivan Mordisco” and “Gentil Duarte,” have been highly active. The 1st Front has been holding a Colombian UN worker hostage for a month after kidnapping him during a meeting with local coca farmers. The 7th Front and unidentified guerrillas have threatened locals in Meta, while the Frente Acasio Medina allegedly briefly held five foreign tourists hostage. The guerrillas have been active in the region for decades and in apparent harmony with “Los Puntilleros,” the name given to what used to be paramilitary organization ERPAC, the dominant drug trafficking group in Colombia’s eastern plains. La Gente del Orden was formed by dissident members of the FARC’s Mobile Daniel Aldana column and militia members from the south-western Pacific port town of Tumaco, Nariño. The group’s leader is former mid-level FARC commander “Hugo,” who took control of the group after the killing of “Don Y” and the arrest of “Mocho,” who initially organized the FARC’s dissidents to become a somewhat unified group. The FARC, together with the ELN, controlled most coca fields in Nariño, leaving much of their criminal heritage to dissident former members and the guerrillas’ former rivals. The group is still in its formation phase and under tremendous pressure from both state security forces and rival groups engaged in drug trafficking, leaving it unclear whether it will be able to permanently establish itself or go extinct. The Nuevas Guerrillas Unidas del Pacifico is a dissident group of La Gente del Orden. The splinter group left the main FARC dissident group in the region around Tumaco after demobilizing FARC ordered the assassination of “Don Y,” the original leader of the dissidents. The group has only registered activity in Tumaco and is reportedly seeking alliances with the Mexican Sinaloa Cartel in order to maintain its income from drug trafficking. So far, the group’s leadership and numbers are unclear. The group is reportedly vulnerable as it has no local allies while being surrounded by rival groups. According to newspaper El Espectador, a group of UN members who visited the region after FARC leader Rodrigo Londoño denounced the appearance of this group in the rural area of ​​Tumaco last month, could corroborate the group’s existence. The newspaper reported that the group is offering $3,400 to demobilizing FARC guerrillas to abandon the peace process and join the dissidents’ ranks. The Guevaristas are a group of dissident ELN guerrillas, possibly enforced by dissident former FARC members, that reportedly formed in November last year. The group reportedly operates in the municipality of Iscuande, also in Nariño, an area traditionally controlled by both the FARC and the much smaller ELN. After the peace deal was signed, the group formed to dispute territory abandoned by the FARC when its troops moved to demobilization camps. The Guevaristas whose leadership is still unknown are reportedly seeking to control coca and mining fields along the Iscuande river. Locals have reported a an increase in kidnappings and violence as the group vie for territorial control with a number of rivals like the ELN, and paramilitary groups like the AGC and Renacer. It is unclear whether the self-called “EPL Southwestern Front Andres Peñaranda” are FARC dissidents or not, since they claim to be part of the EPL, a dissident guerrilla group only active in the northeast of Colombia. What is know that the territory they claim, the municipalities of Corinto and Toribio in Cauca, is former FARC heartland and the EPL’s territory in the Catatumbo region is 700 kilometers away. While some media reports have claimed the group consists of dissident members of the FARC’s 6th Front, locals reportedly claimed the armed men are not from the area and arrived just last month. The post-FARC guerrillas could also be of the 64th Front, which was expelled from the FARC last year. La Silla Vacia reported that local indigenous communities have approached the newly arrived groups to make sure they know they, like any armed group, are not welcome in indigenous territory. The Mayor of Neiva, Huila, reportedly received information indicating that a group of former FARC guerrillas is operating in the rural community of Vegalarga. 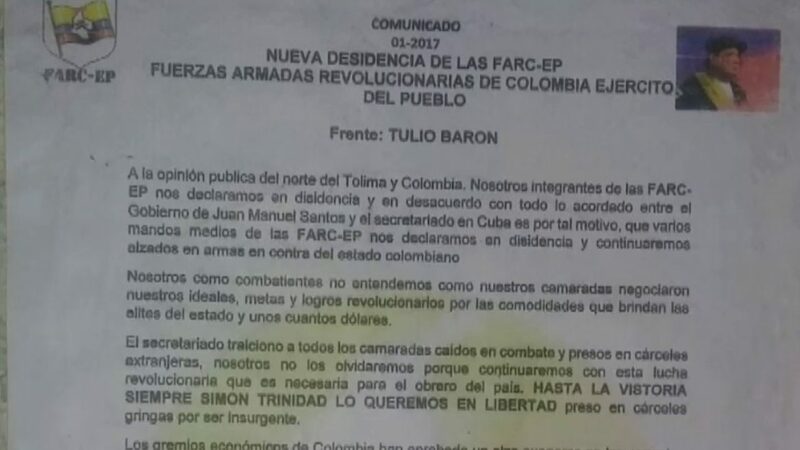 According to the mayor, the unnamed group’s leader is “Benjamin,” a former guerrilla from the FARC’s 17th front who escaped from a demobilization camp with an unknown amount of guerrilla money last year. “El Lindo,” also a former 17th Front member, was also reported to be present at one of the meetings. While police claim that this group cannot be referred to as dissident due to it not having been proven to be a structure, the murder of a local coffee merchant who allegedly refused to pay extortion money to the group has caused concerns the dissidents could become more active in the area if not stopped. A similar presumed splinter group led by “Oliver’ announced its existence in the north of Tolima through a locally spread pamphlet. Whether these are guerrillas or local criminals using the FARC’s name is unclear.